The eukaryotic cytoskeleton. 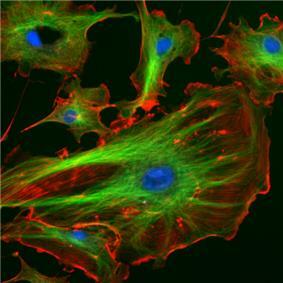 Actin filaments are shown in red, microtubules are in the intracellular matrix that supports cell shape and function. In eukaryotes, the cytoskeletal matrix is a dynamic structure composed of three main proteins, which are capable of rapid assembly or disassembly dependent on the cell's requirements. ^ McKinley, Michael; Dean O'Loughlin, Valerie; Pennefather-O'Brien, Elizabeth; Harris, Ronald (2015). Human Anatomy (4th Ed.). New York: McGraw Hill Education. p. 29. ^ a b c d e f Alberts, Bruce; et al. (2008). Molecular Biology of the Cell (5th ed.). New York: Garland Science. ^ a b c d e f g h Wickstead B, Gull K (Aug 2011). "The evolution of the cytoskeleton". The Journal of Cell Biology 194 (4): 513–25. ^ a b c d Fletcher DA, Mullins RD (Jan 2010). "Cell mechanics and the cytoskeleton". Nature 463 (7280): 485–92. ^ a b c d e f g Gunning PW, Ghoshdastider U, Whitaker S, Popp D, Robinson RC (Jun 2015). "The evolution of compositionally and functionally distinct actin filaments". Journal of Cell Science 128 (11): 2009–2019. ^ a b c Herrmann H, Bär H, Kreplak L, Strelkov SV, Aebi U (Jul 2007). "Intermediate filaments: from cell architecture to nanomechanics". Nature Reviews. Molecular Cell Biology 8 (7): 562–73. ^ Geli MI, Riezman H (Apr 1998). "Endocytic internalization in yeast and animal cells: similar and different". Journal of Cell Science. 111 ( Pt 8): 1031–7. ^ Minton AP (Oct 1992). "Confinement as a determinant of macromolecular structure and reactivity". Biophysical Journal 63 (4): 1090–100. ^ Doherty GJ, McMahon HT (2008). "Mediation, modulation, and consequences of membrane-cytoskeleton interactions". Annual Review of Biophysics 37: 65–95. ^ Paulin D, Li Z (Nov 2004). "Desmin: a major intermediate filament protein essential for the structural integrity and function of muscle". Experimental Cell Research 301 (1): 1–7. ^ Fuchs E, Cleveland DW (Jan 1998). "A structural scaffolding of intermediate filaments in health and disease". Science 279 (5350): 514–9. ^ Steinmetz MO (May 2007). "Structure and thermodynamics of the tubulin-stathmin interaction". Journal of Structural Biology 158 (2): 137–47. ^ a b Mostowy S, Cossart P (Mar 2012). "Septins: the fourth component of the cytoskeleton". Nature Reviews. Molecular Cell Biology 13 (3): 183–94. ^ Mascarelli A (December 2011). "Septin proteins take bacterial prisoners: A cellular defence against microbial pathogens holds therapeutic potential". Nature. ^ Pruyne D, Bretscher A (Feb 2000). "Polarization of cell growth in yeast". Journal of Cell Science. 113 ( Pt 4): 571–85. ^ Shih YL, Rothfield L (Sep 2006). "The bacterial cytoskeleton". Microbiology and Molecular Biology Reviews 70 (3): 729–54. ^ Michie KA, Löwe J (2006). "Dynamic filaments of the bacterial cytoskeleton" (PDF). Annual Review of Biochemistry 75: 467–92. ^ Briegel A, Dias DP, Li Z, Jensen RB, Frangakis AS, Jensen GJ (Oct 2006). "Multiple large filament bundles observed in Caulobacter crescentus by electron cryotomography". Molecular Microbiology 62 (1): 5–14. ^ Ausmees N, Kuhn JR, Jacobs-Wagner C (Dec 2003). "The bacterial cytoskeleton: an intermediate filament-like function in cell shape". Cell 115 (6): 705–13. ^ Peters RA. "The Harben Lectures, 1929. Reprinted in: Peters, R. A. (1963) Biochemical lesions and lethal synthesis, p. 216. Pergamon Press, Oxford.". ^ Frixione E (Jun 2000). "Recurring views on the structure and function of the cytoskeleton: a 300-year epic". 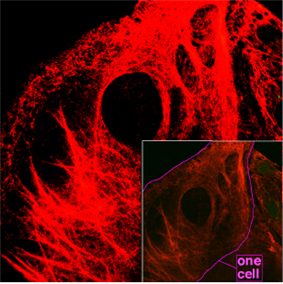 Cell Motility and the Cytoskeleton 46 (2): 73–94. ^ Wolosewick JJ, Porter KR (Jul 1979). "Microtrabecular lattice of the cytoplasmic ground substance. Artifact or reality". The Journal of Cell Biology 82 (1): 114–39. ^ Heuser J (Dec 2002). "Whatever happened to the 'microtrabecular concept'?". Biology of the Cell / Under the Auspices of the European Cell Biology Organization 94 (9): 561–96. A fourth eukaryotic cytoskeletal element, microtrabeculae, was proposed by Keith Porter based on images obtained from high-voltage electron microscopy of whole cells in the 1970s. The images showed short, filamentous structures of unknown molecular composition associated with known cytoplasmic structures. Porter proposed that this microtrabecular structure represented a novel filamentous network distinct from microtubules, filamentous actin, or intermediate filaments. It is now generally accepted that microtrabeculae are nothing more than an artifact of certain types of fixation treatment, although the complexity of the cell's cytoskeleton is not yet fully understood. In 1903, Nikolai K Koltsov proposed that the shape of cells was determined by a network of tubules that he termed the cytoskeleton. The concept of a protein mosaic that dynamically coordinated cytoplasmic biochemistry was proposed by Rudolph Peters in 1929  while the term (cytosquelette, in French) was first introduced by French embryologist Paul Wintrebert in 1931. Cytoskeletal proteins are usually associated with cell shape, DNA segregation and cell division in prokaryotes and eukaryotes. Which proteins fulfill which task is very different. For example, DNA segregation in all eukaryotes happens through use of tubulin, but in prokaryotes either WACA proteins, actin-like or tubulin-like proteins can be used. Cell division is mediated in eukaryotes by actin, but in prokaryotes usually by tubulin-like (often FtsZ-ring) proteins and sometimes (Crenarchaeota) ESCRT-III, which in eukaryotes still has a role in the last step of division. Although tubulin-like proteins share some amino acid sequence similarity, their similarity in protein-fold and the similarity in the GTP binding site is more striking. The same holds true for the actin-like proteins and their structure and ATP binding domain. Tubulin-like proteins are tubulin in eukaryotes and FtsZ, TubZ, RepX in prokaryotes. Actin-like proteins are actin in eukaryotes and MreB, FtsA in prokaryotes. An example of a WACA-proteins, which are mostly found in prokaryotes, is MinD. Examples for intermediate filaments, which have almost exclusively been found in animals (i.e. eukaryotes) are the lamins, keratins, vimentin, neurofilaments, desmin. By definition, the cytoskeleton is composed of proteins that can form longitudinal arrays (fibres) in all organisms. These filament forming proteins have been classified into 4 classes. Tubulin-like, actin-like, Walker A cytoskeletal ATPases (WACA-proteins), and intermediate filaments. FtsZ was the first protein of the prokaryotic cytoskeleton to be identified. Like tubulin, FtsZ forms filaments in the presence of guanosine triphosphate (GTP), but these filaments do not group into tubules. During cell division, FtsZ is the first protein to move to the division site, and is essential for recruiting other proteins that synthesize the new cell wall between the dividing cells. The cytoskeleton was once thought to be a feature only of eukaryotic cells, but homologues to all the major proteins of the eukaryotic cytoskeleton have been found in prokaryotes. Although the evolutionary relationships are so distant that they are not obvious from protein sequence comparisons alone, the similarity of their three-dimensional structures and similar functions in maintaining cell shape and polarity provides strong evidence that the eukaryotic and prokaryotic cytoskeletons are truly homologous. However, some structures in the bacterial cytoskeleton may have yet to be identified. In budding actin forms cortical patches, actin cables, and a cytokinetic ring and the cap. Cortical patches are discrete actin bodies on the membrane and are important for endocytosis, especially the recycling of glucan synthase which is important for cell wall synthesis. Actin cables are bundles of actin filaments and are involved in the transport of vesicles towards the cap (which contains a number of different proteins to polarize cell growth) and in the positioning of mitochondria. The cytokinetic ring forms and constricts around the site of cell division. Septins are a group of the highly conserved GTP binding proteins found in eukaryotes. Different septins form protein complexes with each other. These can assemble to filaments and rings. Therefore, septins can be considered part of the cytoskeleton. The function of septins in cells include serving as a localized attachment site for other proteins, and preventing the diffusion of certain molecules from one cell compartment to another. In yeast cells, they build scaffolding to provide structural support during cell division and compartmentalize parts of the cell. Recent research in human cells suggests that septins build cages around bacterial pathogens, immobilizing the harmful microbes and preventing them from invading other cells. intracellular transport (associated with dyneins and mitochondria or vesicles). In nine triplet sets (star-shaped), they form the centrioles, and in nine doublets oriented about two additional microtubules (wheel-shaped), they form cilia and flagella. The latter formation is commonly referred to as a "9+2" arrangement, wherein each doublet is connected to another by the protein dynein. As both flagella and cilia are structural components of the cell, and are maintained by microtubules, they can be considered part of the cytoskeleton. Microtubules are hollow cylinders about 23 nm in diameter (lumen = approximately 15 nm in diameter), most commonly comprising 13 protofilaments that, in turn, are polymers of alpha and beta centrosome. made of vimentins. Vimentin intermediate filaments are in general present in mesenchymal cells. made of keratin. Keratin is present in general in epithelial cells. made of desmin, play an important role in structural and mechanical support of muscle cells. Intermediate filaments are a part of the cytoskeleton of all nuclear lamina. They also participate in some cell-cell and cell-matrix junctions. Nuclear lamina exist in all animals and all tissues. Some animals like the fruit fly do not have any cytoplasmic intermediate filaments. In those animals that express cytoplasmic intermediate filaments, these are tissue specific. 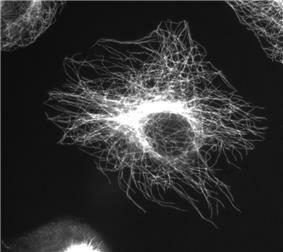 The thinnest filaments found in the cytoskeleton are microfilaments. They are composed of linear polymers of G-actin subunits, and generate force when the growing (plus) end of the filament pushes against a barrier, such as the cell membrane. They also act as tracks for the movement of myosin molecules that attach to the microfilament and "walk" along them. Myosin motoring along F-actin filaments generates contractile forces in so-called actomyosin fibers, both in muscle as well as most non-muscle cell types. Actin structures are controlled by the Rho family of small GTP-binding proteins such as Rho itself for contractile acto-myosin filaments ("stress fibers"), Rac for lamellipodia and Cdc42 for filopodia. Eukaryotic cells contain three main kinds of cytoskeletal filaments: microfilaments which are composed of actin, intermediate filaments which have around 70 different proteins as building blocks, and microtubules with tubulin as the basic subunit. The cytoskeleton provides the cell with structure and shape, and by excluding macromolecules from some of the cytosol, it adds to the level of macromolecular crowding in this compartment. Cytoskeletal elements interact extensively and intimately with cellular membranes. A number of small molecule cytoskeletal drugs have been discovered that interact with actin and microtubules. These compounds have proven useful in studying the cytoskeleton and several have clinical applications. 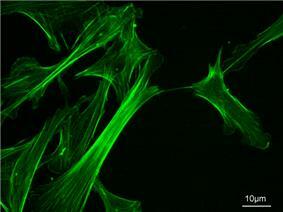 A large-scale example of an action performed by the cytoskeleton is muscle contraction. During contraction of a muscle, within each muscle cell, myosin molecular motors collectively exert forces on parallel actin filaments. This action contracts the muscle cell, and through the synchronous process in many muscle cells, the entire muscle. The cytoskeleton of eukaryotes (including human and all animal cells) has three major components. The best-known components, present also in prokaryotic cells, are microfilaments (made of the protein actin) and microtubules (made of the protein tubulin) . By contrast intermediate filaments, which have more than 60 different building block proteins, have been found so far only in animal cells (apart from one non-eukaryotic bacterial intermediate filament crescentin). The complexity of the eukaryotic cytoskeleton emerges from the interaction with hundreds of associated proteins, like molecular motors, crosslinkers, capping proteins and nucleation promoting factors. Similarly, within the same cell type the structure, dynamic behaviour, and function of the cytoskeleton can change through association with other proteins and the previous history of the network.